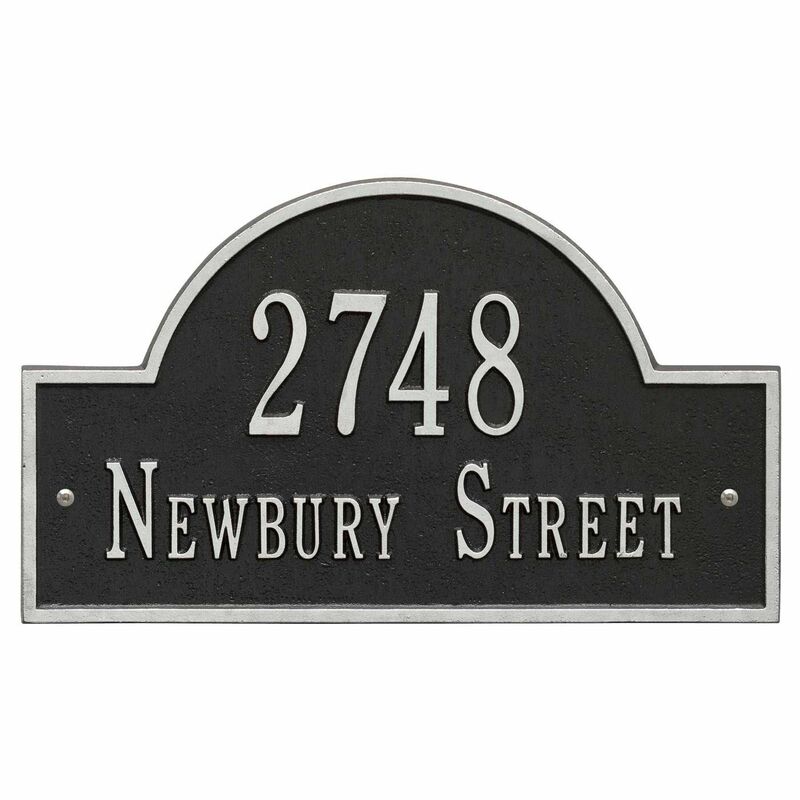 Whitehall Arch Marker Wall Mount Address Sign - - personalized address plaque in standard size and estate size. Arch Extension plaque available for both sizes (optional extension sold separately; see Related Products). Made in USA. The smaller 15.75" x 9.25" Arch Marker is designed for the average size home. The larger 23.25" x 14" Arch Marker is proportioned for larger homes and increased visibility across expansive yards. Both sizes are available with one or two lines of personalized text. One-line signs hold up to five 3" or seventeen 1.25" characters on Line 1. If you are purchasing a Standard size one-line sign, please leave the next input box empty. Thanks. Two-line signs hold up to five 3" characters on Line 1 and up to seventeen 1.25" characters (including spaces) on Line 2. One-line version holds up to five 4.5" characters or seventeen 2" characters on Line 1. If you are purchasing the larger one-line sign, please leave the next input box empty. Thanks. Larger two-line version holds up to five 4.5" characters on Line 1 and up to seventeen 2" characters (including spaces) on Line 2. BG black plaque with gold characters (large image). Small images (from left to right-all in estate size): AB antique brass; AC antique copper; BS black plaque with silver characters; BW black plaque with white characters; GG dark green plaque with gold characters; OB oil-rubbed bronze; OG bronze gold; PS pewter silver; RG red plaque with gold characters; and WG white plaque with gold characters. Dimensions: 15.75" x 9.25" (Standard) / 23.25" x 14" (Estate). You can add one more line of personalization on the optional Arch Extension (sold separately). Purchase additional Arch Extension plaques to create a list of names. The limiting feature is the amount of space available. Exactly what I expected!! Looks Great! !